Others claim to have equivalent rubber hardness, but their 10 lb and 15 lb bumper plates "waffle" easily when dropped. They offer minimal or no posted warranty on their bumper plates. They state that their plates are not made for dropping. Vulcan Bumper Plates Are Made To Be Dropped! The typical Bumper Plate has a thin pressed steel insert which will come out over time with repeated droppings. Our inserts are forged solid steel and anchored into the plate. We were the first to introduce this technology in 2011 and to this day we have replaced less than two dozen bumper plates out of thousands of tons of plates sold. Be aware that low cost bumper plates are made from low cost materials. They are made with recycled materials and use chemicals in processing that contain PAHS. Inferior methods of processing produce low grade rubber with high levels of surface defects and high odor. 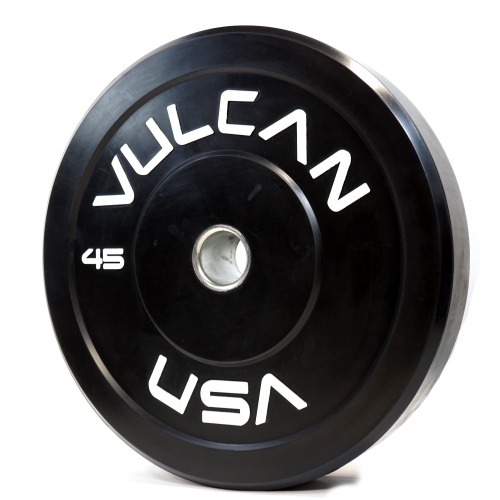 Vulcan bumper plates are PAHS free and made from first use natural virgin rubber. What are Bumper Plates Used for?